A motorcycle helmet is an extremely important element of motorcycle gear for aesthetic and most importantly safety reasons. For neophyte riders, choosing a good helmet is almost as difficult as deciding on the motorcycle itself. The purpose of a motorcycle helmet is to enhance your riding experience to a fun and secure level. Some people consider a bike helmet merely as an afterthought and end up making rash decisions regarding appearance and motorcycle helmet safety. A hastily chosen motorcycle helmet may lessen your riding experience, particularly if the helmet fails to fit or work properly. 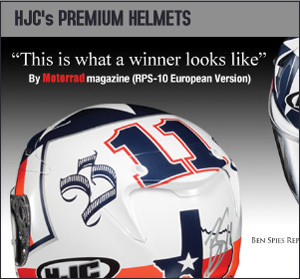 Difficulty in choosing a helmet is not an annoyance singular to novice riders. Even experienced riders that wish to replace their old helmet find the process irksome. A motorcycle helmet dealer, for example, may not carry the make, model or size a rider is interested in. Other times, a rider may not even understand proper sizing. Don't be misguided when it comes to comfort or fit of a motorcycle helmet. False information is particularly detrimental to motorcycle helmet safety since everyone's head is shaped differently and requires different helmet features. The fact is, many factors play into the process of motorcycle helmet choice. We're here to help you find a comfortable, convenient and safe motorcycle helmet.